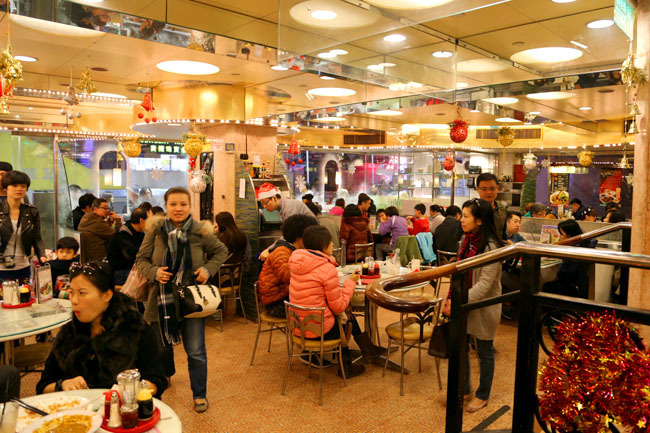 Tsui Wah Restaurant 翠華餐廳 had its beginnings as a ‘bing sut’, a predecessor of tea cafes way back in 1967 at Mong Kok. 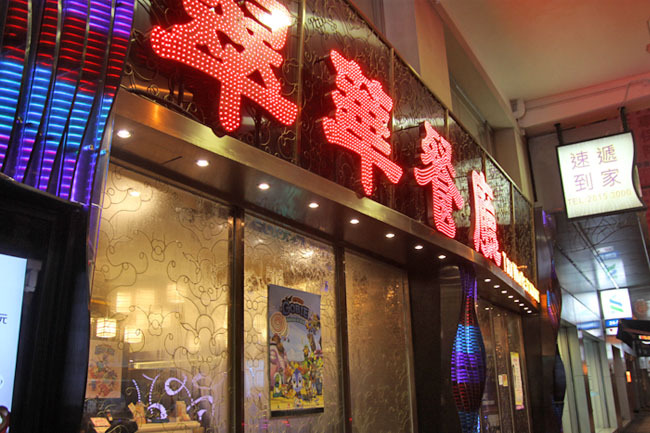 Already a listed company, they are the pricier Hong Kong cafes around. I have not met any Singaporean friend who doesn’t really like Tsui Wah, with its branch at Central Wellington Road becoming our default meeting/gathering place, especially if we need late night suppers in this city that doesn’t really sleep. Know not what to order? 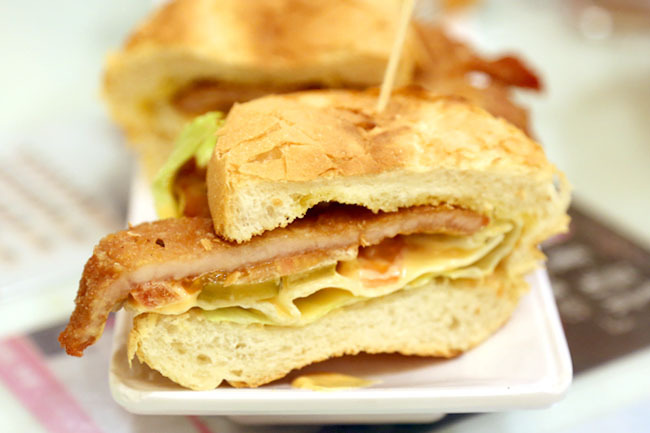 Get one of their “Top 10” food listed in their menu which includes Crispy Pork Chop Bun (HK$35), King Prawns in XO Sauce with Tossed Noodles (HK$51) and Swiss-style Chicken Wings (HK$51). 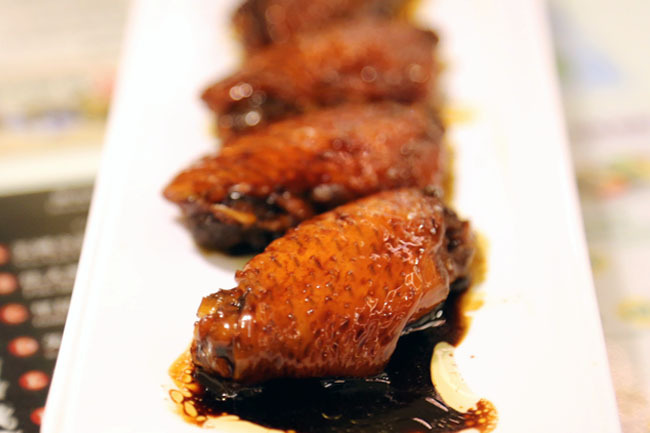 If not, here are 5 recommended signature dishes from Tsui Wah. All my personal favourites that become default orders everytime I go back. Disclaimer: The food at Tsui Wah is not fantastic fantastic (I am certain some individual cha chaan teng would serve better dishes), but it is pretty reliable and tourist-friendly. The winning part of this bun to me is the Portuguese style bread, slightly toasted crispy on the outside, yet still remember quite soft in the inside (some versions I had were slightly dry though). The pork chop could be a thicker slab, but still remains tender tasty. Beware, the French fries on the side are extremely addictive with ketchup. This looks like a pretty ugly dish, but do not judge a dish by its look! 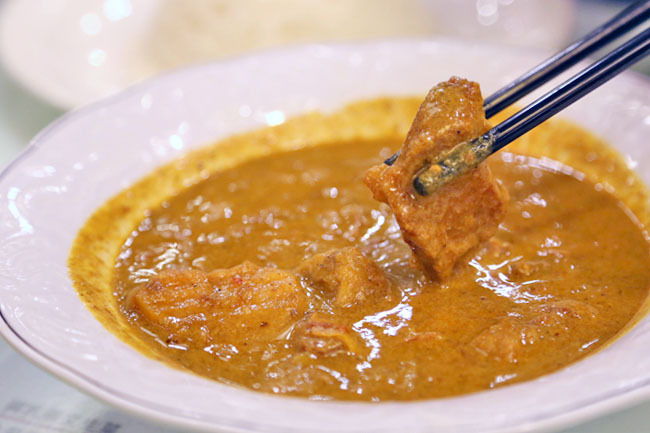 The curry is made from a secret recipe handed down by a Malaysian chef, quite unlike the usual Singapore style curries that are coconuty and thin. The stewed beef brisket almost melts in the mouth, and I couldn’t stop pouring the thick gravy over my rice. Nom nom nom. Tsui Wah’s milk tea is love. 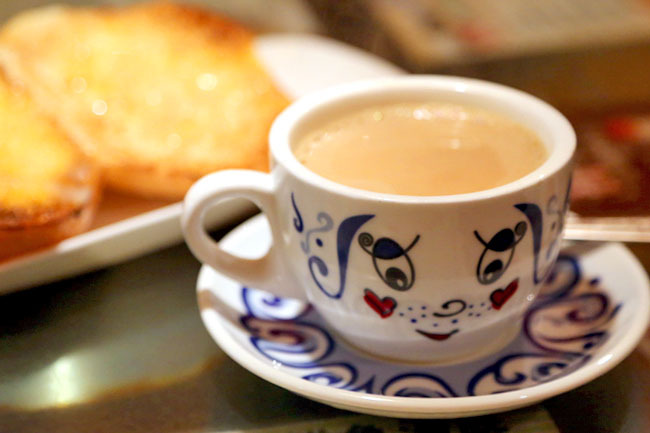 Made with premium Ceylon tea leaves, and Holland’s Black & White evaporated milk, it is silky and not overly bitter or sweet. I will have the iced version without fail, matched with simple crispy bun drizzled with sweet condensed milk. You can buy bottles of the milk tea back (I seen SQ girls buying by the dozens), but be careful as mine spilled in my bag! 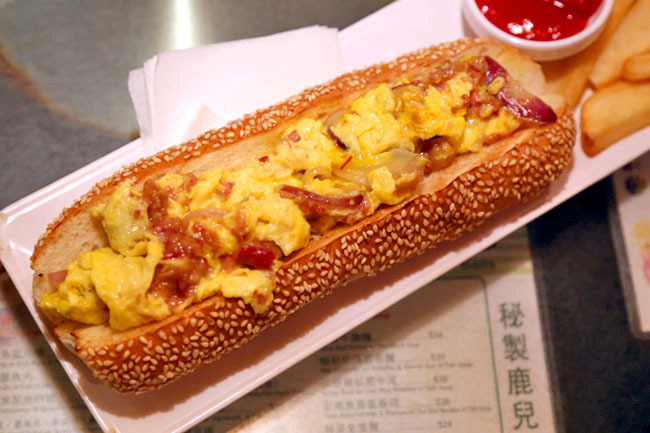 Strange that I am loving so many carb dishes, but what is there not to love with a delicious (and unhealthy) 11 inch jumbo hot dog bun with scrambled eggs, onions and traditional sauce. Juicy and moist, please share this big one with your friends. 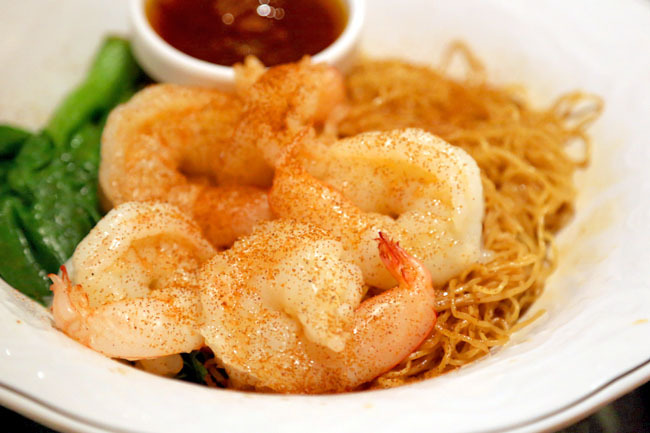 The egg noodles are chewy and thin, though can be slightly dry for some. The king prawns were succulently fresh with a bite, extremely pleasurable to be chewing on them. Another two of other favourite dishes are the Swiss Sauce Chicken Wings (HK$55), worth licking your fingers for the dark sweet soya sauce, and Fish Balls and Fish Cakes in Fish Soup (HK$30), with the balls freshly made daily with over 10 types of fresh fish and yellow eels. 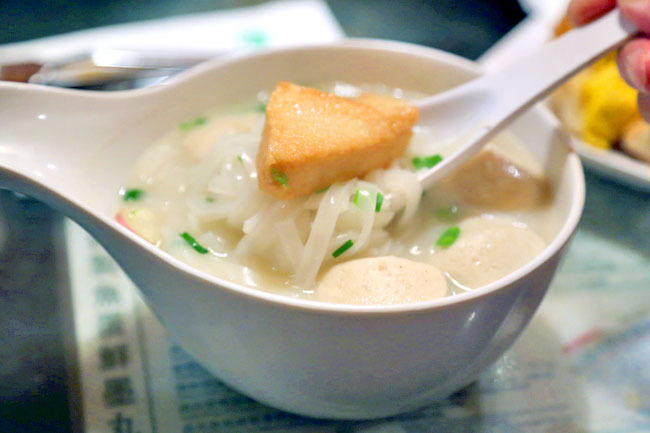 Which is your must-order dish from Tsui Wah? My fave has to be the beef brisket curry! Shrimp with egg omelette rice!!! Yums!